The printer ID sign makes it easy to identify the physical printer. By scanning the QR code you can open Printix App and select the printer in one go. All Printix printers gets a unique three-letter ID, also known as, the printer ID. If you want customized printer ID signs and/or print on adhesive labels, then use Download printer ID sign. The CSV file can be used with for example Microsoft Word to design and control what information you want on the ID sign. Insert for example help desk contact information and your company logo. Select one or more printers and select Modify. Select Print printer ID sign. Use the browser to print the page with the printer ID signs. If you selected multiple printers you can select Download printer ID sign to make customized printer ID signs. If you printed on adhesive labels, then mount the label on the printer itself or on a surface at the printer. Otherwise use a scissor to cut out the slip with the three-letter ID and QR code. Use adhesive or double-adhesive tape to mount the ID sign on the printer. If you have adhesive pockets to hold business cards (90mm x 50mm) or credit cards (85mm x 55mm), you can mount these and put the ID sign inside. Select multiple printers and select Modify. Select Download printer ID sign to download the CSV file: signIds.csv. Use Microsoft Word to design a customized printer ID sign and print on adhesive labels. Open Microsoft Word and start a new document. 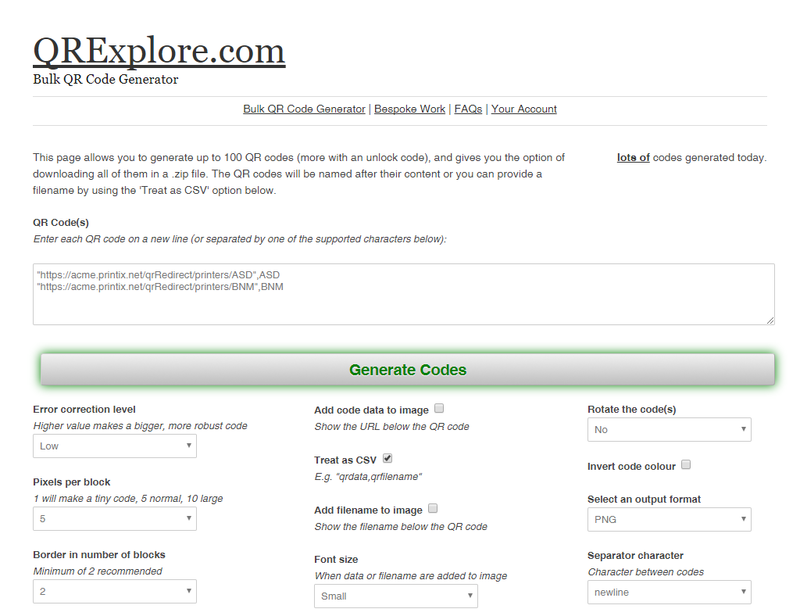 Select your Label Options and select OK.
Browse to and select the downloaded signIds.csv file. Select Open. Select Insert Merge Field to insert for example signID and name. 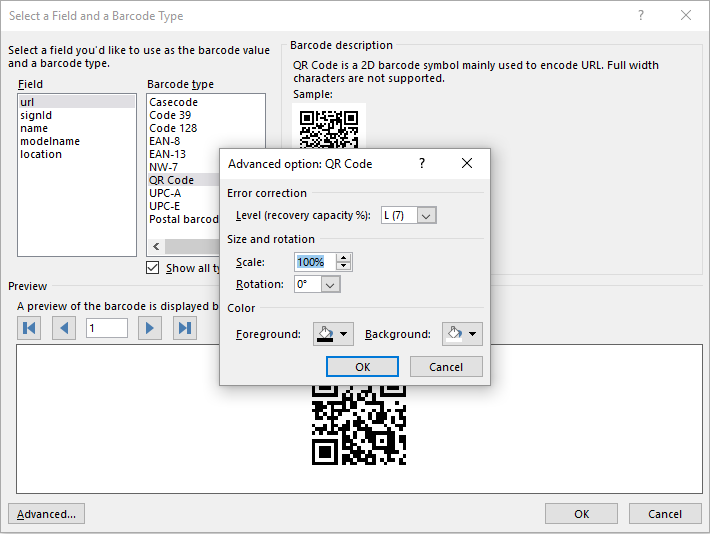 If you want to change the size of the QR code image, then right-click the field code, select Edit barcode… and then select Advanced… at the bottom of the screen. Save the document, so you can use it to reprint labels or make new ones. Open your browser and goto qrexplore.com/generate. Insert the printers’ url and signId values from the downloaded signIds.csv file. Optionally change Pixels per block from the default 5, which will result in a 165 × 165 image to for example 3 (99 × 99) or 2 (66 × 66). A value of 20 will give an image of 660 × 660.